Oops - we don't appear to have a video for the can Anywhere 5 Wifi. Whether you are at home or at the office,on a plane or at a conference,the IRIScan Anywhere 5 is perfect for scanning anything,anywhere. Compact,lightweight and fully autonomous,this is the ideal scanning device for mobile users - you won't need any cable or computer to use it! Don't be fooled by its size and ultra-portability,the IRIScan Anywhere 5 has a very long-lasting battery life:It will scan your heavy piles of documents in no time thanks to a stunning 8-pages per minute scanning speed (300/600 DPI). 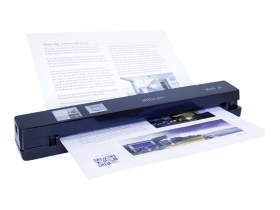 IRIScan Anywhere 5 is the ideal device to make all your documents digital - no matter where you are. The brand new IRIScan Anywhere 5 Wifi includes Wifi connectivity that allows you to transfer all your images instantly to your computer,smartphone or even tablet.